Maracuja is typically extracted from two sources. It can come from passion flowers, or from the seeds of passion fruit. Both the flower and the fruit carry many health benefits. The use of maracuja oil goes all the way back to the Aztec civilization. It is rich in antioxidants, minerals, and vitamins. It’s healing properties range from helping with inflammation to relieving stress. It can also help calm anxiety and relieve itchy skin. The oil is an excellent source for skin rejuvenation. It will keep your skin hydrated and moisturized. It works wonders for dry skin, skin that may be acne prone, and skin that has been damaged by the sun. Maracuja will leave your skin refreshed, replenished, and revitalized. 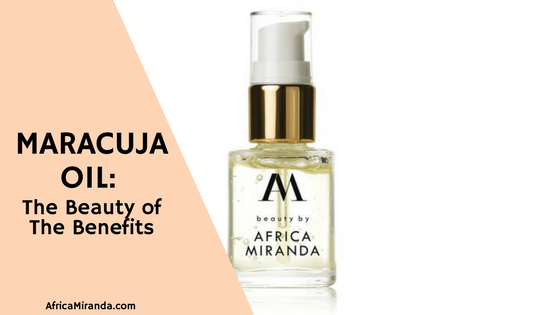 The Facial Elixir from Beauty by Africa Miranda, blends maracuja oil with other skin nourishing ingredients to give your beauty regimen a boost. The Facial Elixir was curated to protect, rebuild, and restore. It is safe for sensitive skin, but it’s wise to always test out any new products in a small dose to make sure your skin is receptive. The elixir can be used in the morning and at night. With the perfected blend of maracuja oil, the Facial Elixir is a great moisturizer for anyone looking to rediscover their glow.